Syrphetodes decoratus, photographed by S. E. Thorpe. The Ulodidae is a Gondwanan family of beetles, members of which were formerly classified with the Tenebrionidae or Zopheridae. Synapomorphies (from Leschen & Rhode 2002): Antennal insertions visible in dorsal view, eyes entire or not anteriorly emarginate, procoxal cavities closed, lateral mesocoxal cavities open with exposed mesotrochantins, aedeagus with a dorsal tegmen. [LR02] Leschen, R. A. B., & B. E. Rhode. 2002. A new genus and species of large extinct Ulodidae (Coleoptera) from New Zealand. New Zealand Entomologist 25: 57-64. [LR04] Leschen, R. A. B., & B. E. Rhode. 2004. 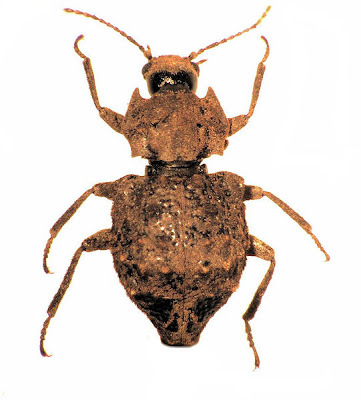 A replacement name for Archaeophylax Leschen and Rhode (Coleoptera: Ulodidae). New Zealand Entomologist 27: 125.